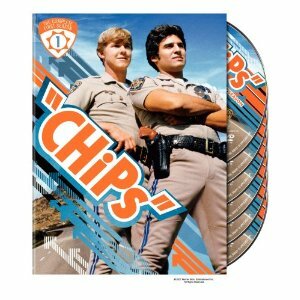 Man, I loved "CHiPs." And you have to write it like that, too -- "CHiPs." For some reason, I would always try and catch the spelling of Ponch's last name when the opening credits flashed on his nametag, but it was too fast and the shadow was falling on it weird and we didn't have TiVo or VCRs back in those ancient days, so I never could. --Once I got older and Rob told me that the scenes where Ponch and Jon were next to each other riding down the highway on bikes, they were totally being towed on a flatbed trailer. Hysterical now that I know to look for it. --Whenever they showed the main character's homes, which were so Seventies they squeaked. --How Ponch and Jon never ever drew their weapons. --The completely weird guest stars. (Danny Bonaduce as a karate-trained cat burglar!) The punk rock episode with Pain and Snow Pink. The roller disco episode. The episode where the surfers and the Vals fight it out for control of the beach. How could you not love this show? Plus once it hit top popularity, everyone knew someone who had the action figures. You can now get it on DVD, and thank God for that. It should really run 24-7 somewhere, the way that stupid "Everybody Loves Raymond" does. You are so right about the 24-hour CHiPs channel. But also thank you, because you know what's in my head right now? I also now have the theme song in my head! I loved John. He seemed so sweet. I met Eric Estrada recently. He was very nice.